Since the release in 2003 of the Davey Water products’ ISOspec range of large end suction centrifugal pumps, many new customers in the industrial and commercial market have re-discovered why for decades Australians have “Depended on Davey”. The ISOspec range of large capacity pumps are suited to a wide range of pumping applications, including broad acre irrigation, building services, municipal or industrial water supply, leisure systems and numerous general water, liquids transfer or circulation duties. The Davey ISOspec pump range is designed to suit a wide range of liquid transfer or pumping operations and provides full compliance with International Standards ISO 2858. The ISOspec pump range is designed for flows up to 900 cubic metres per hour and heads to a maximum of 160 metres. 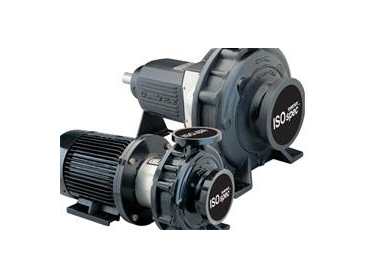 Importantly, the ISOspec pump range is available in two configurations. The ISOspec CF series are bare shaft pumps which can be coupled to an electric or diesel drive. The ISOspec CM series are close coupled electric motor pump units, in a ready to bolt down combination. In creating the features of the ISOspec range, Davey has placed great reliance on input from its dealer network, pump engineers and system designers to build a robustly designed, compact pump as a space saving alternative and available at a competitive price. Key features include a back pull out design which allows removal of the rotating element without disturbing the pipework or removal of lagging or the pump volute casing. This ensures minimal downtime for routine maintenance and avoids the need for coupling realignment. The design includes a standard high quality mechanical seal, replaceable wear rings and case O-ring seals for a trouble free lifecycle. The Davey ISOspec impeller has been hydraulically designed to maximise flow and efficiency to ensure long term cost efficient pumping. A bronze impeller comes as standard or a cast 316 stainless steel impeller is available as an option, while the impeller diameters can be trimmed to suit specific performance requirements. Davey has introduced the ISOspec range into this sector with a number of product quality and design enhancements, which will make this pump range the preferred product choice of pumping system designers, suppliers and installers.Full compliance with ISO standards also makes our ISOspec the ideal pump choice for the replacement market.